I'm glad your table format is still 1E! Fun little analysis. The retroclones ought to have a smaller development budget, but could spend similarly on art and printing. As a percentage of median income, the percentage difference is %.19 for AD&D 1e vs. %.27 for 5eD&D, or a difference of +%.08 for 5eD&D. But we can't stop here (this is bat country). Other things need to be taken into consideration: what was the cost of living like in 1979, vs 2017? What percentage of income is an individual or family spending on rent/mortgage, auto payments, insurance, tuition, food, gasoline, utilities...? All of this needs to be taken into consideration. It's not just saying "Well the dollar was so-and-such value back then versus so-forth and so-on now..." You have to factor in many other variables. 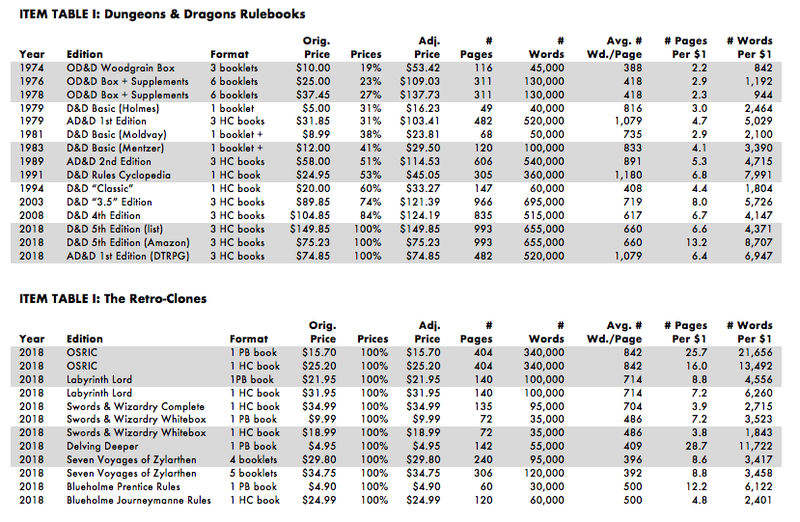 *=I use this figure because in 1979 Amazon didn't exist; odds are you were buying your AD&D at the hobby shop and paying full retail so, in the interest of an even level comparison we likewise use the full retail price here. But then, even after all of that, there's what's going on with the actual market. I mean, I have no idea whether, say, a family with a working father in a similar job to what my father had would be better off (or worse off) in 2018 than in 1975. But I do know that in 1975 I was a paper boy, probably making $1 an hour. I also had no other expenses. And so taking, say, a week's part-time wages and being able to buy with them an SPI "monster" wargame, or, a few years later the Monster Manual, seemed perfectly fair to me. I don't think using retail price for 5E is actually fair here. The advantage of being able to purchase books off Amazon has every right to be included as the advantage of increased wages or inflation. If we want adequate comparisons, we need to consider all the factors (just like we would do if we were to choose between purchasing book-A in the local store versus book-B off Amazon). Really good point about the median income, though. That is fascinating. And I love the chart. The futura font and the grey fill on the table, well those are just... priceless. The basic rules for 5e are free. The Players Handbook ($20 bucks on Amazon last week) is the only must add. The MM is very nice addition. 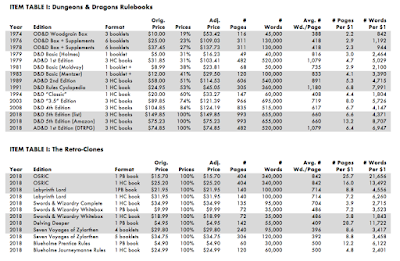 I think D&D is as affordable as it has ever been. Excellent Article. You've outdone yourself Oakes! Thank you for this, Oakes. Nothing to add. It’s delightful as-is. My impression (which could be wrong) is that C&C was sort of a "bridge product" during the wilderness years before the clone explosion and Wizards deciding to reintroduce OD&D, Classic D&D and AD&D products through reprints and PDFs. Also, it was one of the most important factors for making those developments possible. But do many people play it (or, more importantly, buy it) now? Recreational books are a tiny factor(<.1) in CPI-U, CPI-W, or C CPI-U. Using it any CPI whole for one item is a misuse of CPI. was 9.95 MSRP, or after a hardback book discount which where very popular in the 70s. For example, I got my books from Gemco(think early wal-mart) and 30% of, and in the early 80s you could get as much as 50% off at some popular book chains. It's still one of the cheapest hobbies there is. There weren't three HC books of AD&D in 1989. The Monstrous Manual didn't replace the Monstrous Compendium ring binder until 1993. 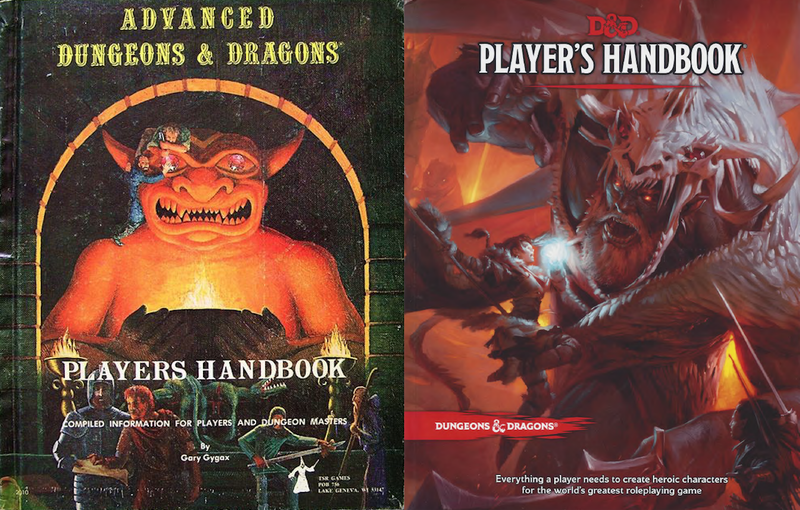 Also you can't reasonably compare the (mostly) two colour printing and so-so art of AD&D 2nd edition with the full colour lavishly illustrated 3rd edition onwards books. Today's books are so much better and nicer books so even if they are more expensive, they are worth it.